Ethiopia is currently suffering one of the worst droughts in more than 50 years, around 10.2 million people are in need of food aid and 300,000 children are undernourished. It was against the background of another disastrous drought in 1974 that SOS Children's Villages started working in Ethiopia. In the decades since, a series of droughts have hit the country and we have increased our activities to support vulnerable families and children. Over 90 million people live in Ethiopia – it is the one of the most populous countries of the African continent. Repeated droughts and famines, a long-lasting civil war and a border conflict with neighbouring Eritrea have taken its toll. In spite of recent economic growth and governmental efforts to improve the lives of vulnerable families and children, the number of people living in poverty remains extremely high, especially in rural areas. 85 per cent of people live off agriculture – producing food to feed their families or to sell. However this is a risky existence in a region where rainfall is erratic and there are frequent droughts. When the situation in the countryside deteriorates, struggling families are often forced to move to cities in order to survive. There have been some improvements in health, however, the figures remain worrying: the life expectancy rate is only 61.4 years and infant and maternal mortality rates are among the highest in the world. Infectious diseases can spread quickly when sanitation facilities and drinkable water is limited. In rural areas only 48 per cent have access to clean water and 28 per cent to sanitation facilities. The situation is made even worse due to the shortage of medical staff and health centres. Although the number of new HIV infections in Ethiopia has dropped over recent years, HIV/AIDS remains a major cause of vulnerability for many Ethiopian children and their families. Officially, around 730,300 have HIV/AIDS but the real number is believed to be higher. 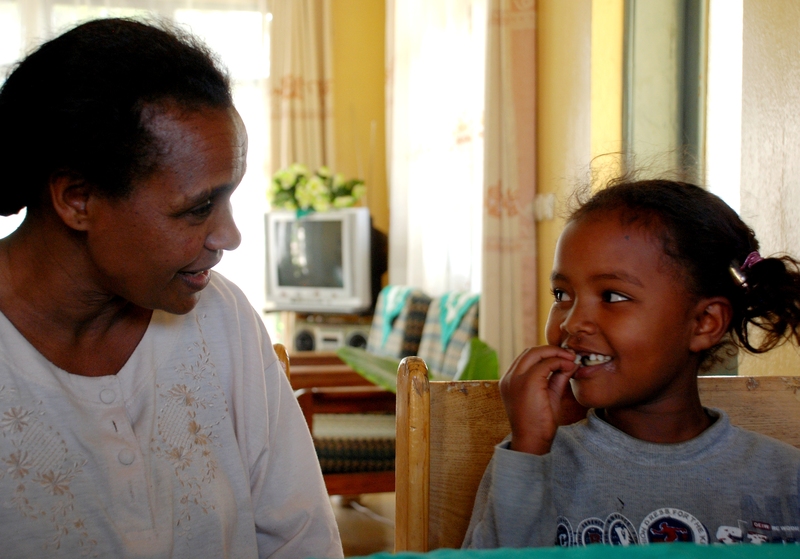 For a fear of social discrimination, many Ethiopians do not get tested or decide to keep their HIV status hidden. There are an estimated 46.4 million children under the age of 18 in Ethiopia. In spite of governmental initiatives, getting children to stay in school remains a problem: only 41 per cent of children finish primary school and just 16 per cent go on to secondary school. Many families simply can't afford to send their children to school. Children are most vulnerable at times of water and food shortages. Over 6.1 million children are in need of humanitarian assistance in 2016. There is an increase in the incidence of child labour and trafficking and rise in gender based violence. Growing number of children are falling sick with diarrhoea and malnutrition. Contagious diseases like eye infections and scabies are becoming more common as families cannot wash their bodies or clothes. Strengthening families: We work with local groups to support families who are at risk of breaking down. Our assistance includes material assistance and counselling for parents and children. In 2015, we reached over 12,000 children. Care in SOS families: If, in spite of all assistance, children cannot live with their families, they can find a new home in one of the SOS Children’s Villages. In 2015, over 2000 children were growing up in SOS families. Some of these families live in houses integrated in the community. Support for young people: We provide young people with support and training until they are able to live independently. Education: We run kindergartens in seven locations. Older children can attend one of our seven schools, which provide primary and secondary children for over 4500 pupils. Medical care: Due to the scarcity of affordable medical care, SOS Children's Villages set up medical centres. These provide impatient and outpatient treatment to pregnant women, as well as to mothers, babies and children. We also run workshops on health subjects. Most of our patients come from local families, who could otherwise not afford to receive treatment. Emergency programme: SOS Children`s Villages is currently working with the government and other agencies in order to deliver emergency aid to families affected by the drought and famine. We are planning to provide emergency food, access to sanitation facilities and clean water, medical care, emergency shelter and non-food items. We will also increase our child protection activities. Our long-term project includes building resilience so that communities are strengthened and prepared for future environmental disasters.